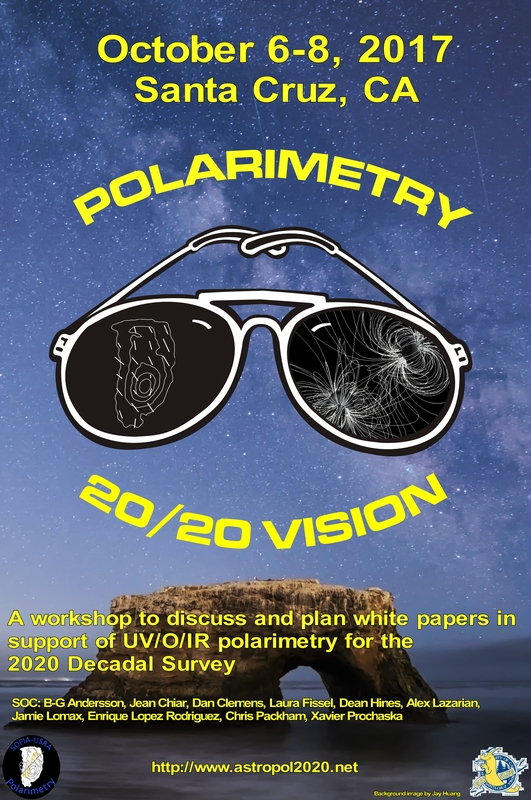 Welcome to the web site for the “Polarimetry 20/20 Vision” workshop. The workshop, planned for October 2017 in Santa Cruz, CA, is intended to discuss and organize the writing of White Papers in support of Ultraviolet, Optical and Infrared polarimetry to the 2020 U.S. National Academy of Science Decadal Survey of Astronomy and Astrophysics. The workshop is intended to be the mid-point of a process to generate, discuss, and submit white papers to the Decadal Survey. Starting in the winter of 2016/2017 astronomers are invited to join topical working groups to identify the important opportunities of, and urgent challenges for astronomical polarimetry in the coming decade. After reviewing and discussing these drafts at the Santa Cruz workshop the working groups will hone and finalize the white papers and submit them to the 2020 Decadal Survey.